Four kids . . .
Two weeks in the Florida Everglades . . .
One top-secret science experiment that could change them and the world as they know it . . .
Meet Quentin, a middle-school football star from Chicago; Sarah, a hockey player from Upstate New York; Ben, a horse lover from the Pacific Northwest; and Cat, an artistic bird watcher from California. The four have little in common except the head injuries that landed them in an elite brain-science center in the wild swamps of Florida. It’s known as the best clinic in the world and promises to return their lives to normal, but as days pass, the kids begin to notice strange side effects and unexplained changes. 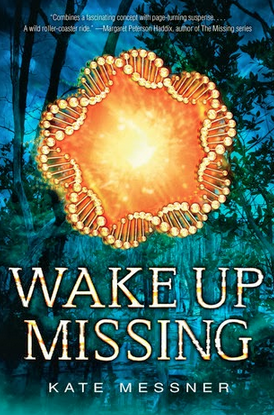 Why I recommend it: Wake Up Missing is a fascinating combination of futuristic science and old-fashioned adventure and mystery in the Florida swamps. The way the author managed to stir in traumatic brain injuries, a one-eyed alligator, a man who collects butterflies, and four kids from diverse backgrounds (and then season it all with a dash of political intrigue) makes for one remarkable dish. As an adult reader, I found the doctor's experiments a little far-fetched, but I could see my ten-year-old self eating this up. You might recognize Kate Messner as the author of the Marty McGuire series of younger chapter books (yay! I love Marty McGuire! ), and from Capture the Flag and other novels. Have you read Wake Up Missing? What did you think? And if you haven't read it, what recent mystery/adventure would you recommend? For other MMGM posts, see Shannon's links. Synopsis (from the publisher): Philadelphia, PA, 1835. Rufus, a twelve-year-old chess prodigy, is recruited by a shady showman named Maelzel to secretly operate a mechanical chess player called the Turk. The Turk wows ticket-paying audience members and players, who do not realize that Rufus, the true chess master, is hidden inside the contraption. But Rufus’s job working the automaton must be kept secret, and he fears he may never be able to escape his unscrupulous master. And what has happened to the previous operators of the Turk, who seem to disappear as soon as Maelzel no longer needs them? Why I recommend it: The Philadelphia connection drew me in (I was born in Philadelphia, as was my father and, in fact, both of his parents), but then I kept reading because, hey, it's Gary Blackwood (The Shakespeare Stealer) and he's a master of historical fiction filled with intrigue and atmosphere. What the synopsis doesn't tell you: first, Rufus is handicapped (but never makes a big deal out of it), and second, this novel is loosely based on true events. Johann Nepomuk Maelzel was a real person, the Turk was an actual invention in the age of steam, and Edgar Allan Poe (who plays a cameo here) really did write an essay about Maelzel's chess-playing automaton. For links to other MMGM posts, visit Shannon's blog. Congratulations, Greg! Look for an email from me asking for your mailing address. The publisher will then mail you the book. 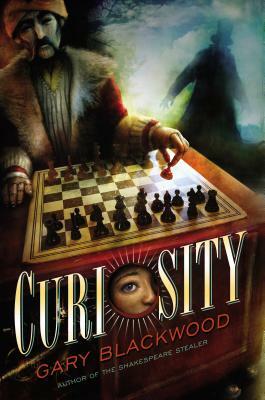 I'll be back next week with a feature on Curiosity, Gary Blackwood's newest novel. Until then, happy reading.